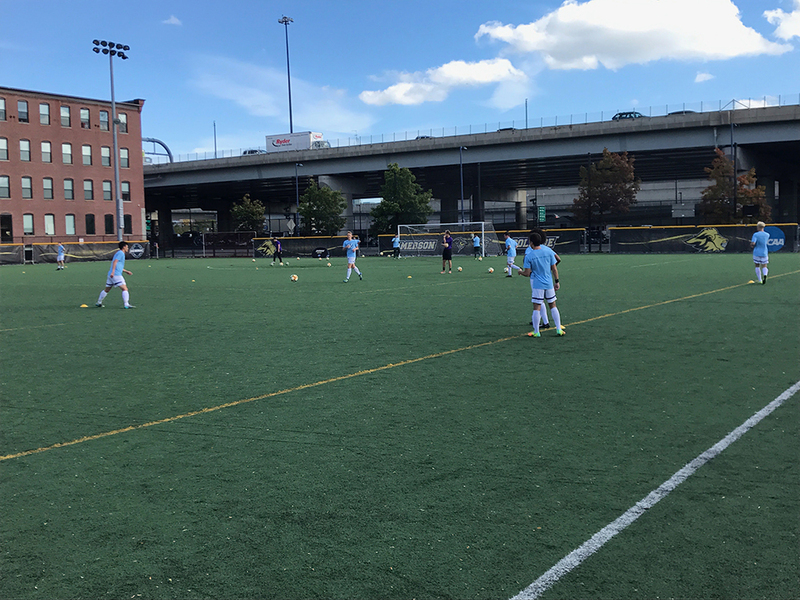 Emerson and MIT players donned blue warmups as part of their effort to raise funds for Soccer Without Borders at their game on Saturday. While Saturday’s clash with MIT barely affected the men’s soccer team’s NEWMAC standing, the game was far from meaningless. On senior day Saturday, senior midfielder Franco Araujo O'Neill scored the lone goal, giving Emerson its first NEWMAC win of the season. The game was dedicated to Soccer Without Borders, and players wore blue shirts before the game to recognize the cause. Soccer Without Borders is an international nonprofit whose goal is to use soccer to help improve the lives of young immigrants, refugees, and asylees that have fled to the United States. Rachael Cooper, the girls program associate for the organization, said that they focus on five principles: soccer, educational support, civic engagement, team building, and cultural exchange. Cooper talked about what makes Soccer Without Borders unique from other local nonprofits. Lions head coach Bryan Harkin said he often worked for the nonprofit when he coached at Loyola in Baltimore from 2009 to 2014. He reached out to their East Boston office when he moved to Massachusetts. Harkin has run multiple camps and training sessions for the organization in the past. “It’s an organization close to my heart,” Harkin said. The men’s soccer team raised $1,064 for Soccer Without Borders on crowdfunding website CrowdRise prior to Saturday’s season finale and Harkin hopes to work more with the charity in the future. Senior goalkeeper Lucas Fischer echoed Harkin’s support for the charity. “It’s just a great opportunity to really give back to the community through a mutual passion,” Fischer said. Fischer also stood out for the Lions in his final game with the team, making six saves and earning a shutout. Senior forward Niko Emack-Bazelais assisted Araujo’s winning goal, which was his first career goal. The Lions came under heavy pressure from MIT after scoring, but they survived MIT’s late onslaught to earn their first NEWMAC victory of 2017. While the squad had nerves as the clock wound down, Fischer said they were motivated to pull through. With such a spectacle surrounding their final game, Fischer was happy that the team delivered a great performance to match the occasion.